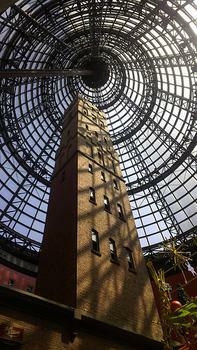 The 50 m high Coop's Shot Tower is a heritage building dating back to 1888, when it was built for the production of lead shot balls. The 50 m high Coop's Shot Tower is a heritage building dating back to 1888, when it was built for the production of lead shot balls. The castellated tower produced 6 tonnes of shot weekly till its closure in 1961.